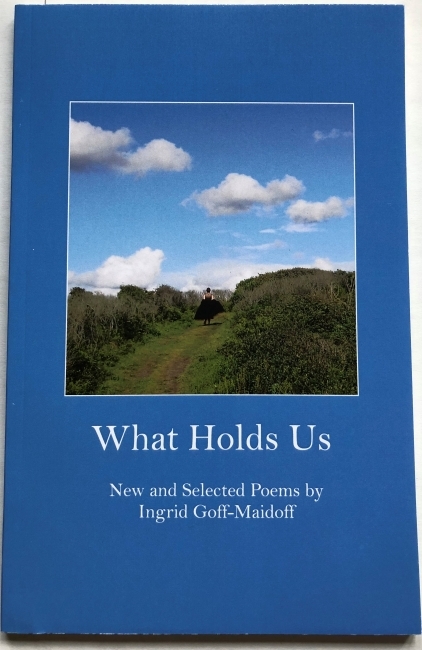 "Ingrid Goff-Maidoff's latest book of poems, What Holds Us, is a collection of verse you will treasure. You will find yourself re-reading these poems over and over, when her wisdom needs to find you." The poetry of Ingrid Goff-Maidoff celebrates a deep and vibrant intimacy with nature, lover, family, daily living and the world. These are soul nourishing, spiritually centering poems that will both open and strengthen the reader's heart. What Holds Us contains new works as well as the best loved poems from the limited edition chapbooks, Calling Forth The Riches, and Conversing With The Holy. 80 pages, paperback. "I keep going back to the poems in What Holds Us; one delicious poem after another. So glad you're out there doing what you do. " ~D.C.